In warmly welcoming the continuation of Mark Speakman as Attorney General of NSW, peak community law organisation Community Legal Centres NSW has outlined three key areas of reform for the new government to ensure that more people in NSW have access to justice. “The community law sector welcomes the opportunity to continue working with Attorney General Mark Speakman. A new four year term for the Liberal/National Coalition government presents a fresh opportunity for reforms which benefit people and communities, while taking pressure off the justice system and other public services,” Community Legal Centres NSW Chairperson Katrina Ironside said. “Among the many important areas of reform, our sector is seeking an early commitment from the government in the areas of child protection, justice reinvestment and consent relating to sexual assault,” she said. “The government introduced child protection legislation at the end of 2018 against the advice of the legal, community and Aboriginal sectors. The NSW government now has the opportunity to engage with the voices raising concerns, working towards reducing the number of children being forcibly removed from their families and placed in out-of-home care. We know that for young people this can lead to problems with the justice system down the track. “Early legal support is essential for keeping children safe and families together. Helping people navigate the system, take the right steps and access available services can stop children being unnecessarily removed from their families. This is particularly urgent in rural, regional and remote areas of NSW, where there is a reported lack of support services for families. “Both state and federal governments have so far failed to respond substantively to the Australian Law Reform Commission’s 2018 Pathways to Justice report, which recommended that justice reinvestment underpin reforms to address the disgraceful incarceration levels of Aboriginal women, men and children. “Governments must support Aboriginal-led solutions to the challenges they face. The Maranguka Project in Bourke shows that community-led justice reinvestment works. It’s time for the increased commitment to Aboriginal communities across NSW. Increased, long-term support for justice reinvestment and a detailed response to the ALRC report would be welcome developments. “The NSW Law Reform Commission review of consent in relation to sexual assault is a landmark opportunity for the NSW government to spearhead cultural change in relation to sexual assault and violence against women. “Ensuring the law captures the need for clearly communicated affirmative consent, along with community education for the public, judiciary and law enforcement, will take us closer to a society where women are safe, respected and supported. 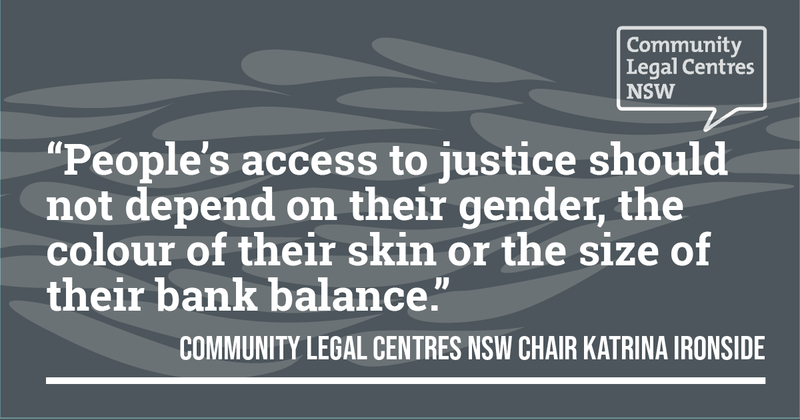 “Community Legal Centres NSW will continue to engage constructively with political decision-makers and the broader community. Our sector has recently worked with the government around improvements to laws for renters, women escaping violence and people struggling with credit and debt. “People’s access to justice should not depend on their gender, the colour of their skin or the size of their bank balance. The work of community legal centres helps people navigate tough times, ensuring that people get the assistance they need when they need it, and particularly people and communities experiencing disempowerment, discrimination and economic disadvantage,” Ms Ironside said.